Item is a composite photograph of the 1925-1926 Dalhousie-Kings Senior Hockey Team. The photograph consists of portraits of C. M. Upham (Business Manager); J. McManus (Manager); N. R. Waddington (Left Wing); R. C. Wilson (Captain, Left Defence); W. Creighton (Left Wing); J. F. Bates (Centre); J. Lewis (Goal); A. E. Coleman (Right Wing); G. A. Ernst (Right Defence); and G. Langstroth (Right Wing). Headshots of the players and the managers and action shots of the players are arranged around a photograph of the Forrest Building. 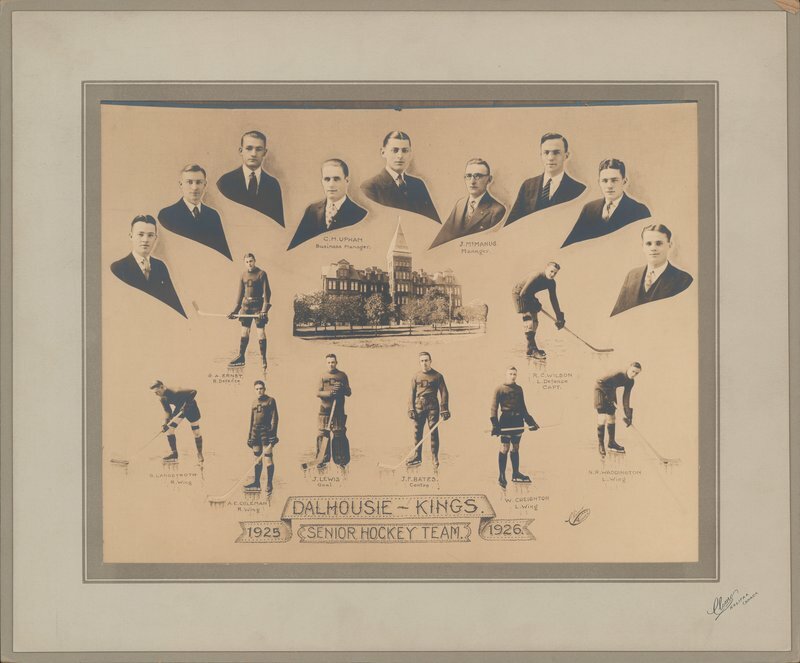 Climo's Studio, “Composite Photograph of Dalhousie-Kings Senior Hockey Team, 1925-1926,” Dalhousie Libraries Digital Exhibits, accessed April 25, 2019, https://digitalexhibits.library.dal.ca/items/show/1041.